We received the very best shower gift EVER when I was pregnant with Roo…. My aunt Ellyn sent us a Bugaboo Frog stroller. We have used it almost every single day for the past four years, adding the toddler board once Jasper was born. It is maneuverable and compact and well-engineered in almost every way. (I do wish that it had the extendable handlebar like the newer Chameleon model, since I am 5'2" and Bob is 6'2". It would also give us more clearance for the toddler board.) Every time we're at the zoo, I look at the massive travel systems and think about how thankful I am to my aunt for rescuing us from one of them. The only thing it lacks is storage and cupholders. Enter Carry You. The company's tagline is Innovative Stroller Accessories and they live up to that claim. They offer a range of heavy duty accessories designed to make your stroller more functional so mom and dad don't have to be pack mules. The Carry You line include snack trays, cupholders, organizers and saddlebags, all made of durable luggage grade black nylon. We got to try the Piccolo Small Snack Tray. It attaches easily to the lap bar with an extra strong wide strip of Velcro. It can carry toys, a sippy cup, snacks, etc. and even has elastic loops on the back where you could hook some links or a pacifier tether. Since Jasper has just become aware of his ability to grab things and throw, it was kind of like arming him. I am not as into the "mommy pick it up" game, so I might have to pack the Piccolo away until he mellows out a bit with the throwing! It would have been perfect for Roo's toddler years, though, when we would constantly have to stop and dig her sippy or snacks out from under the stroller. 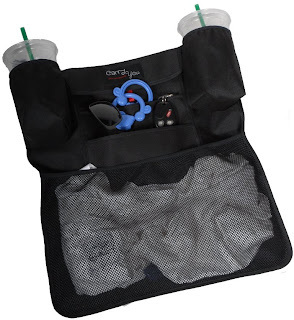 I would love to try the Milan Deluxe Organizer which features not one but TWO cupholders! It would be perfect for long family walks now that the weather is getting nice. The Naples Saddlebag would also be very handy, especially in a pair. I hate digging diapers out from under the stroller seat and if we had two of these, we could probably take the Bugaboo basket off completely. 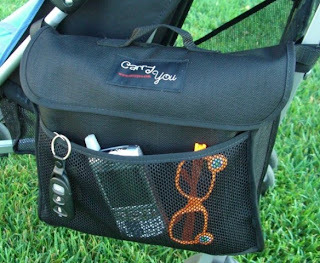 Carry You offers a comprehensive list to show which of their products is right for your stroller. Go see what will work best for you!